This 34×61′ concrete lot is located in active Outdoor Resorts, a 55+ community, situated on Lake Davenport, offering boating and fishing, is about 4 miles to the entrance to Disney, with quick access to about 40 restaurants to the East and the countryside to the West. 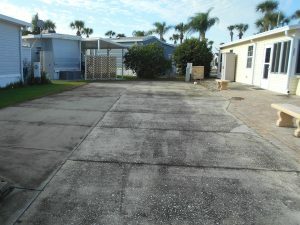 The lot is situated right next to a home that’s for sale. So….if you’re looking for a home plus a place to park your “toys”….this is it! The well maintained community is gated and the HOA fees ($490/qtr) pay for your water, sewer, basic cable, trash, and lawn mowing. It will be hard for you to find less expensive living in this area. ORO offers Bingo, Sunday morning church, a free 9-hole chip-n-putt golf course, shuffleboard, pickle ball, tennis, a home-made miniature golf course, its own post office, two heated pools, and a small laundry facility. Come relax in the best kept secret in the four corners area!